Rainbow Rosalind – New Zealand's Award-winning singing fairy! Welcome to the magical world of Rainbow Rosalind the fairy! Award-winning Children’s Singer/Songwriter Rainbow Rosalind will enchant and delight you with her original interactive songs and fun videos for kids of all ages! So have a fly around, and make sure you check out my upcoming shows in the ‘What’s On’ tab! 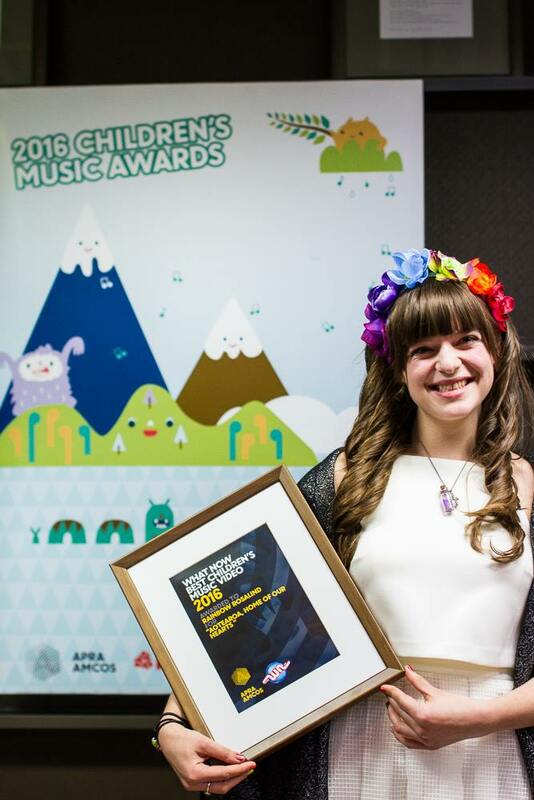 Rainbow Rosalind flew all the way over the rainbow to the New Zealand Children's Music Awards, where she was awarded the 'What Now Best Children's Music Video' award for her original music video 'Aotearoa, Home of our Hearts' - Check it out here! Rainbow Rosalind Meets the Orchestra! Rainbow Rosalind’s latest show ‘Rainbow Rosalind Meets the Orchestra’ has just been released by SOUNZ! Click below to check out the trailer and enjoy all of the songs! A packed Dunedin Town Hall greeted Rainbow Rosalind the Fairy and the Dunedin Youth Orchestra (conductor Anthony Ritchie) for the premiere of ‘Rainbow Rosalind Meets the Orchestra’, a fun introduction to the orchestra for kids.Rainbow Rosalind was joined on stage by her pals Fairy Cherry (Juliette Bernard) and Fairy Evergreen (Victoria Bernard), with appearances by Orion Carey-Clark ('Percussion Man' / 'Harry Potter'), Siôn Davies ('Percussion Man' / 'Steve Tunin') and Claire Barton ('Claire the Opera Singer').‘Rainbow Rosalind Meets the Orchestra’ was the result of Rosalind Dwan Manowitz’s 2017 SOUNZ Community Commission (https://bit.ly/2Y7RbaR), a scheme administered by SOUNZ in which New Zealand composers work with community groups to create and perform new works. The scheme has been running since 1999.Gather up the little people in your lives and follow us over the coming week as Rainbow Rosalind introduces us to the different parts of the orchestra. Film made with funding from NZ On Air.